Taking The Charge Podcast Episode 199: We talk Kevin Durant moving to the Golden State Warriors, the 2016 FIBA Olympic Qualifying Tournaments, and the 2016 FIBA U17 World Championship. 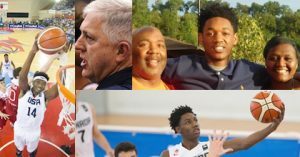 We have interviews with RJ Barrett, Wendell Carter Jr., Don Showalter, Austin Wiley and Vickie Wiley. Episode 199: A little bit about Kevin Durant going to the Golden State Warriors as well as the Olympic Qualifying Tournaments before we go in depth into the 2016 FIBA U17 World Championship. Tags 1990 FIBA Basketball Women's World Championsihp 1992 Olympics 2016 FIBA Olympic Qualifying Tournament 2016 FIBA U17 World Championship Austin Wiley Collin Sexton Don Showalter Gary Trent Jr. Kevin Durant RJ Barrett Rowan Barrett Jr Vicky Orr Vicky Wiley Wendell Carter Jr.